Being a fairy can be rather stressful most of the time. Most fairies are smaller than spare change so there’s always a chance of being stepped on. Rabbits tend to think they make good snacks. Oh, and have you ever tried clothes shopping for a fairy? Most stores don’t really carry such tiny options for our winged friends! In any case, being a fairy also has plenty of upsides, one being that fairies throw the greatest parties ever. This tiny fairy is attending a fun party tonight and would love your help putting together a fun outfit. 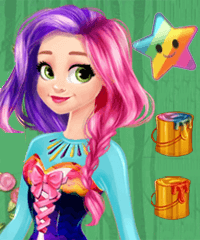 You can customize everything, including the colors and accessories, giving your little friend a fabulous look for tonight. She’ll likely thank you but her fairy voice is very tiny so listen closely!